For the 1936 Berlin Games Hitler ordered that a rally should be included for motor cars, convinced that Germany would triumph with its all-conquering Mercedes or Auto-Unions. Official Olympics poster rally badge Information leaflet see below for translation. Paul Abt and Betty Haig, Gold medal winners in the 1936 Olympics, Berlin. 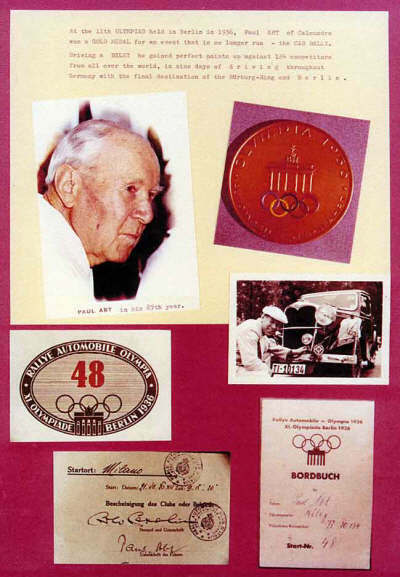 In 2003 Scott Rainbow from Australia supplied information about a 1936 Riley Falcon 1500cc (12/4 Falcon) and it's driver Paul Abt who competed in the 1936 Olympics in Berlin, Scott sent pictures of some of the material that came from the estate of Paul Abt - he retired to Caloundra, Queensland, Australia. More recently in 2013 Paul Abt's great-nephew, Grant Abt contacted me enquiring if I had any more information, I contacted Edward Preiswerk, a Riley owner and member of the Swiss Riley Club, both have provided additional information, rally driving was a special Olympic event (Internationale Olympia Automobile Sternfahrt, there was also a motorcycle rally - Internationale Olympia Motorrad Sternfahrt at the same time) referred to as a "demonstration or exhibition event" it commenced on the 22nd July and ended at the AVUS track, Berlin. A motorsport demonstration/exhibition event was also run at the 1900 Olympics Paris - I found this report "In the 1900 Olympic Games in Paris, motoring was an exhibition sport, as opposed to a full Olympic event. There were 16 events, featuring not only cars, but taxis, trucks and motorcycles as well. Interestingly, the categories included both cars with gasoline and electric engines. The events included road rallies, with cars traveling over specific distances within certain time constraints, the main event running from Paris to Toulouse in the South of France and back to Paris. Other events tested both the reliability and the mileage of these early automobiles. One of the winners of the Paris-Toulouse-Paris rally was Renault founder Louis Renault." In 1936 Paul started in Milan accompanied by his wife Hanny and daughter Irene as co-drivers, we do not have a report of Paul's exploits but the only English entry is well reported. The driver was Betty Haig the great-niece of Field Marshal Haig , her flatmate Barbara Marshal was her co-driver in a Singer 6 cylinder 1.5 litre Le Mans. Unfortunately no record exists of what happened to Paul's car but Betty's is still in existance and owned by Gifford Wright, editor of the Singer Owners Club magazine. 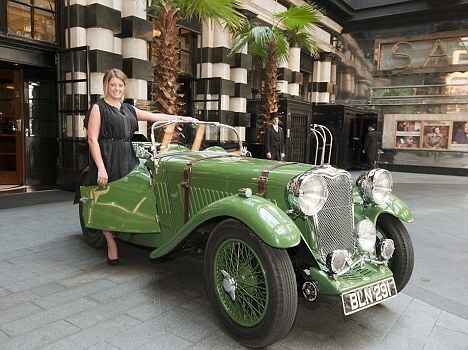 He bought it in 1987 as a "box of bits" and it is now fully restored, during the 2012 London Olympics it was on display at the Savoy Hotel which was reported in the Mail Online . Unfortunately we did not have the pleasure, to welcome you on Monday, 3 August 1936 for the prize giving of the International Olympic Rally. We would like to extend our heartiest congratulations for your achievements by handing over your GOLDEN Olympia-Automobile Medal. The log-book is also attached. We hope this medal will remind you of your stay in Berlin”. 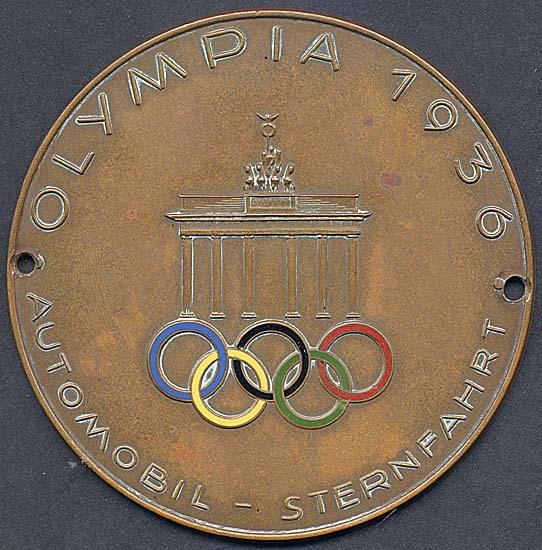 It has been said that because the Germans did not win the rally (see below, it appears that there were many "winners") the award ceremony was quickly rescheduled to the AVUS track from the Olympic stadium. There has been some debate on how both Paul and Betty seem to have won the gold medal! 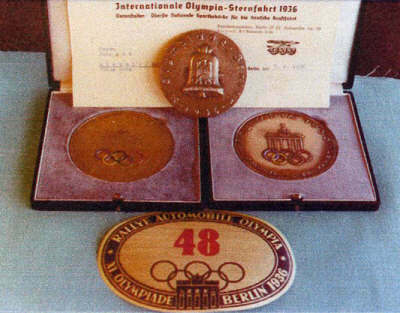 it has now been discovered from the official information leaflet that Edward found that all motorists who acquired more than 2,000 points (Betty who was the first driver home collected 2,162 points) will be awarded the Olympic Competitive Tour Medal in Gold, those with over 1,000 points will receive a Silver medal and all others who have completed the tour according to the regulations will be awarded a Bronze medal. This explains why Paul had a Bronze and Gold medal, one for completing the course and one for collecting over 2,000 points. 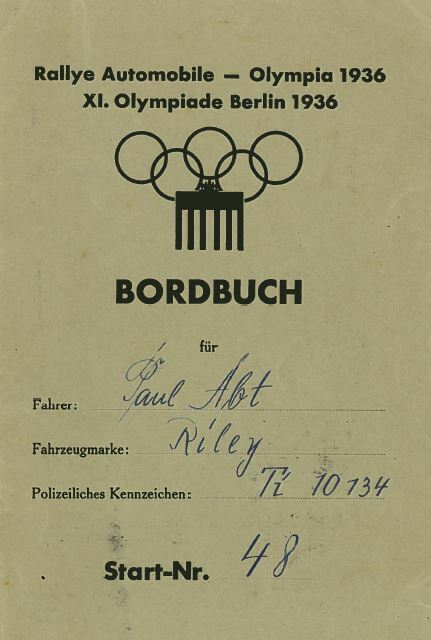 Unfortunately the International Olympic Committee informed Grant that they do not have the results of this race but from Paul's log book shown below (which is difficult to clearly read some of the hand written scores) he appears to have collected 250 points at most if not all of his 10 control checks making a possible score of 2,500 points (see score card below - make up your own mind). There were 124 entrants to the rally according to the official start list, although Betty says 125 in her report, 67 from Germany, 11 from CSR (Czech republic), 5 from Holland and Austria, 4 from Yugoslavia, 3 from France, Poland, Switzerland, Denmark, Rumania, and Hungary, 2 from the U.S.A, Finland, Sweden and Italy, 1 from England, Letland (Latvia), Turkey, Norway, Bulgaria and Portugal. Below - Translation from German to English of the information leaflet (cover shown above) issued to all entrants. 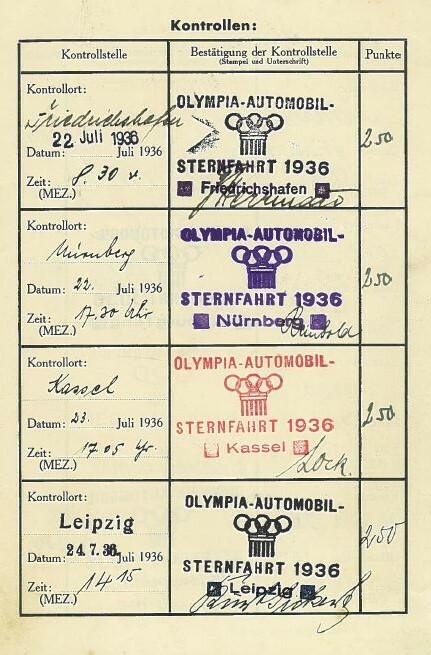 International Automobile Sternfahrt for the XI Olympic games, an International Automobile Sternfahrt to Berlin. The Olympic German Organising Committee has invited all sport nations of the world for the classic event of sport, so does the First National Sport-Adminstration invite all motorists of this world to take the road to Germany and visit the Olympic Games. The International Automobile Sternfahrt to the XI Olympic Games will guide the enthusiastic motorists of all countries to Berlin, where the Olympic Games take place. The road will show the most beautiful parts of Germany. Germany as the host country has prepared everything for the reception and presents to his guests its warm welcome. The motor vehicles will be judged irrespective of their horsepowers. Motorists of all nations can participate in the Sternfahrt. No licenses are required. Each participant is responsible to have the documents required. All cars must participate with at least 2 persons who may drive the car alternately. Control Book - Each participant receives a control book. Prior to the start all names of the participants must be registered. B. 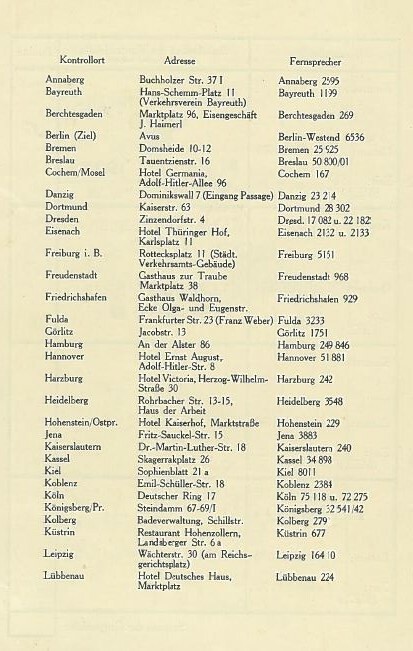 The credit points for sections within Germany are outlined in the attachment. The exact locations of the control points are mentioned in the control book. Each driver needs to make sure that at the control locations the entries into control book are duly registered. The control points are open daily from 9h to 18h, for the period of 22 – 30 July. The driver may only use one control point per day, midnight to midnight. Each control point counts only once for judging. Exception to this rule: a participant once having crossed the German border, having reached the first control point, can continue to a second one, this one must however be 250 km away from the first one. For each control point 250 credit points are allocated. Consequently each participant can reach a maximum of 10 control points within the 9 day period, 22 to 30 July. On 26 July the "Grand Prix of Germany for racing cars“ will take place on the Nürnburgring. A control point at the start and finish will be installed from 9h – 18h. Each Sternfahrt participant who participates in the race, will receive 400 credit points. Participants coming from overseas receive 500 credit points upfront. They must reach the German border by 28 July 17h at the latest. The destination of the Sternfahrt is located at the AVUS in Berlin. All participants must reach the finishing control on 30 July between 12h and 18h. Vehicles that are late are excluded. 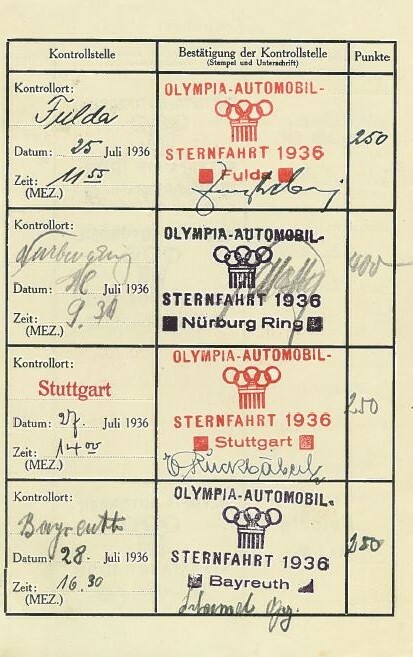 The motorist is responsible for having his control book duly registered at each control place. Control entries that are not properly recorded are not counting for credit points. 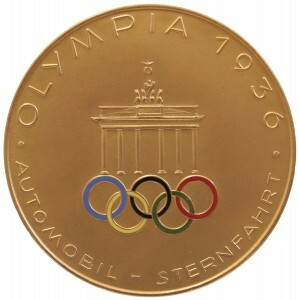 The Olympia Sternfahrt Medal in Gold is for all participants who have reached 2000 or more credit points. 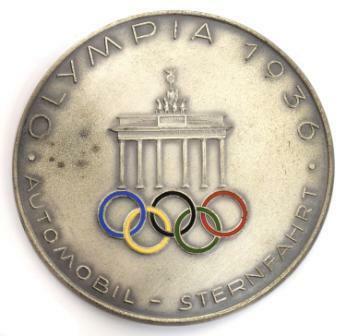 The Olympia Sternfahrt Medal in Silver is for participants who have reached 1000 credit points. 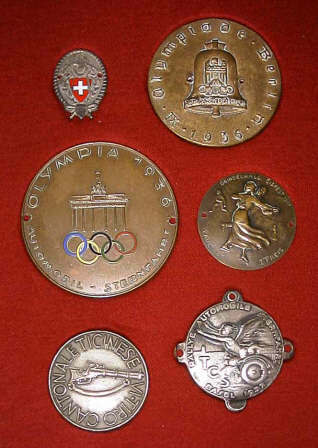 The Olympia Sternfahrt Medal in Bronze is for those who have duly completed the Sternfahrt. The entry fee is French Francs 125.- per vehicle. 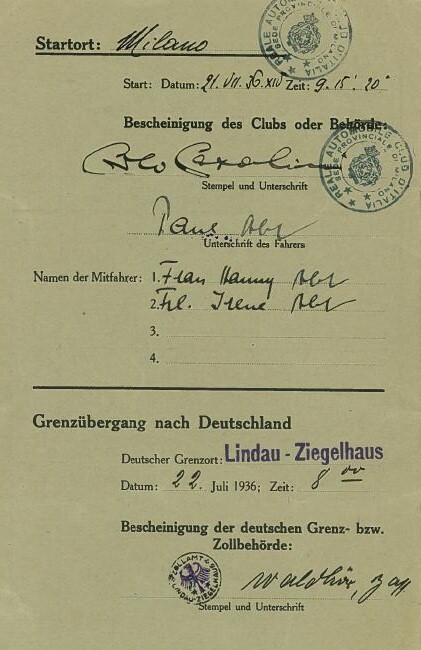 Payments in Reichsmark are not accepted. The allocation of numbers are made according to the apllications received. General terms - Participants are required to observe the traffic laws of each country they drive through. Each participant drives at his own risk. Immigration rules - For entry into Germany from 25 July to 16 August no international driving license is required. Your national car papers and your personal driving license is sufficient. Customs offices. It is valid till 16 September 1936. Below - one of the entrants owned this silver cup, maybe a sponsor presented it to him after the event. 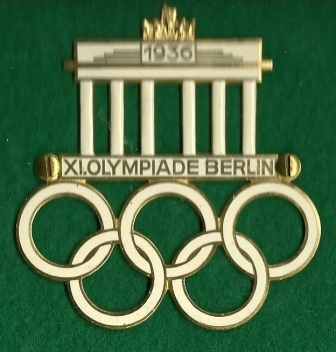 The German Olympic Rally, which was organised this year by the Oberste Nationale Sportbehorde and the National Automobile Clubs, to be run in connection with the Olympic Games, attracted a good entry of 125 competitors. Starting Controls were situated in every country (many similar to those used in the Monte Carlo Rally). Almost every European country was represented in the entry list, while even America produced three entries. 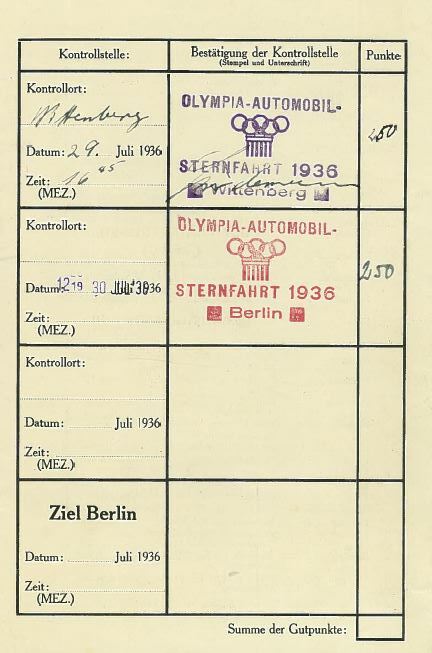 The Rally commenced on the 22nd of July and points were given for the distances covered before reaching the finishing Control on the AVUS Track, Berlin; every day Controls had to be reached before a certain time, in the usual way. The Singer 1 ½ litre was the only British entry. For over 2,000 miles, under very varied conditions and all manner of roads, the car maintained a high average speed, without mechanical, trouble of any kind, to win the highest award, the OLYPMIC GOLD MEDAL. Our starting control was Birmingham. After leaving the offices of the Royal Automobile Club, we headed for Dover to catch the night boat to Ostend. From Ostend we drove through Belgium, via Brussels and Louvain, non-stop for the German frontier, where there was a tremendous welcome for all foreign visitors to the Olympic Games; a triumphal arch spanned the road, draped with wreaths and greenery and supporting a mighty banner with the words: “Willkommen in Deutschland!” The Olympic Rally numbers on the Singer were noticed immediately, and the frontier guards hurried through the minimum of formalities, our control book was stamped, and we were soon on the move. In Aix La Chappelle we paused for an instant, uncertain of our direction. Immediately a charming young German appeared and telling us to follow him, he sprung upon his bicycle and pedalling madly, led us through the town and set us upon the road which we wished to take. This happened in almost every large town through which we passed. On arriving at the outskirts, one had only to pause for an instant, looking slightly lost, for a helpful citizen to appear, and on noticing our foreign number plates, he would instantly take charge of our welfare! The German people certainly extended a wonderfully spontaneous and friendly welcome to their foreign visitors this summer. Everywhere that we went we found people ready to be helpful and do their utmost to make our journey a success. 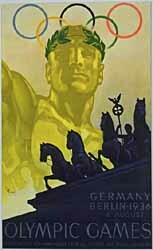 At 3 p.m., in great pomp and shepherded ceremoniously by more cyclists, we reached the Cologne control; there, under the banners bearing the Swastikas and Olympic Rings, we presented our control book while steel-helmeted sentries presented arms! Our next control was Heidelberg, and for nearly 160 miles we followed the twisting, cobbled roads which run beside the banks of the Rhine and through the famous terraces of vines which clothe the lower slopes of the rugged hills with their dark castles, which in the evening light, almost appear to be part of the rocks. Several miles before Heidelberg appears the large, new notice board, “Reichsautobahn,” the narrow main road is suddenly dwarfed by the great right-hand fork and one finds oneself upon one of the finest new motor-roads in the world. The wide, double-tracked road sweeps across the gently undulating country, between the pine woods; completely free from all advertisement hoardings, petrol stations and red brick villas, this new road has been so designed that it seems to harmonise in a most unexpected and pleasing manner with the countryside through which it passes. After Heidelberg and Stuttgart our route continued due south to Friedrichshafen, Lake Constance and the Bavarian Alps. Our speed became more and more leisurely as we followed the narrow, dusty roads that twist their way through the little South German villages, charmingly picturesque, but with their endless corners and narrow streets that seem to be forever blocked by the slow-moving ox-waggons, laden with hay, scarcely ideal for making a good average speed on a rally! Before long the fine weather broke, and at Friedrichshafen the lake looked grey and forbidding, while the great Zeppelin sheds loomed mistily through the torrential rain. All through the mountains the rain continued, and it was not until we headed north through Nurnberg to Silesia and the Czecho-Slovakian frontier, the weather improved. Along the shores of the Danube, the loose, dusty surface of the roads swiftly became a sea of mud in relentless downpour, so that by the time we checked in at Annaberge, the travel-stained car had taken on quite a Monte Carlo Rally appearance! 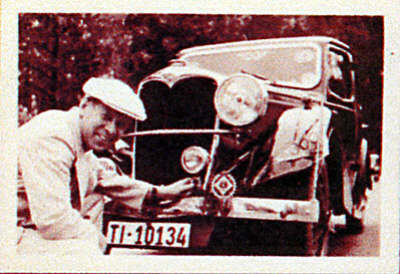 During the whole journey the Singer had caused the usual stir of interest at every town in which we stopped, but at the Annaberge control, where, apparently, the people had never seen such a car like it in their lives, the crowds swelled to such enormous proportions that finally the police had to be called out to attempt to cope with the situation, as the entire business of the town was held up! After the wooded hills of the south, northern Germany seemed somewhat flat and dreary, and we pushed on fast over the last lap to Berlin. The roads, on the whole, were surprisingly bad; except for a few miles of new autobahn near Leipzig, we travelled over many miles over an appalling surface of worn cobbles and muddy potholes. 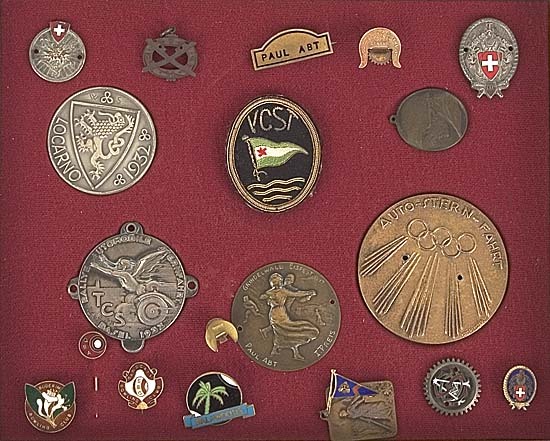 As we neared Berlin, the atmosphere became even thicker with Olympic symbols; every house, shop window and car displayed its banner or pennant with five coloured rings. At the entrance to every town, a banner spanned the road, bearing a different message of welcome. 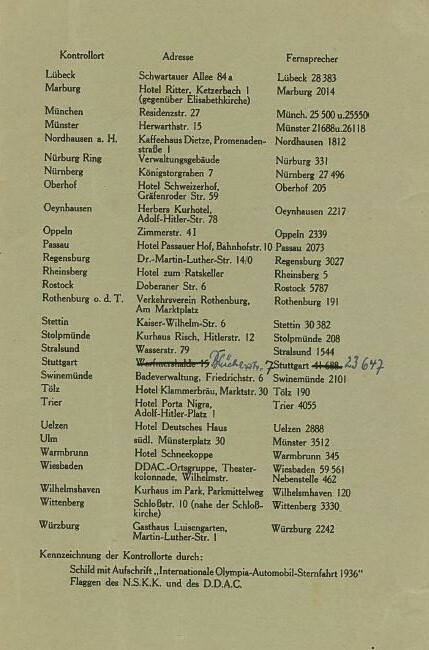 Some 50 kilometres from Potsdam, a policeman pulled us up, while a squad of Brownshirt presented us with a document printed in many languages, giving full instructions concerning the driving regulations in Berlin during the Olympic Games, also other pamphlets containing useful information for foreigners. In brilliant sunshine we reached the Avus Track and drew up amidst the many dashing uniforms which surrounded the final control, being the first car to finish, with a total of 2,162 points. After the formal reception on the Avus (with many introductions and heel-clicking) we drove on into the city, down the Unter den Linden, through a glittering sea of flags and the huge, strolling crowds of all nations, which lined the streets of Berlin day and night. The Olympics were officially opened by Adolf Hitler on the 1st of August and closed on the 16th August. 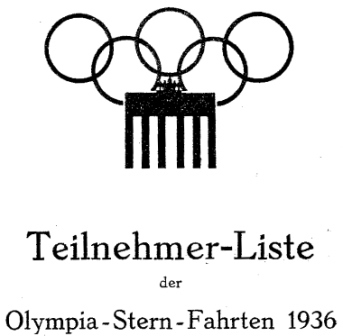 A Report on the 1936 Olympics - http://en.wikipedia.org/wiki/1936_Summer_Olympics , no mention of the "Rallye Automobile" in the report though or in the official Olympic website - http://www.olympic.org/berlin-1936-summer-olympics probably because it was a special one off event and held before the official start of the Olympics and at different locations. 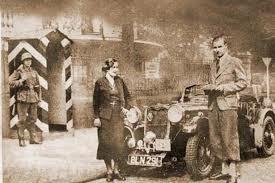 Scott believes that Paul Abt was the first person to drive across the Sahara solo - but not sure if it was in a Riley. Many thanks to Scott, Grant, Edward and Gifford for their invaluable assistance in providing much of the information contained on this page. If anyone any information on other competitors in the rally I would be glad to hear from them and I will add it to this page.